Philadelphia, PA – In the latest development in the “Occupy ICE” protest encampments spreading across America, protesters have set up a new encampment outside an ICE building at 8th & Cherry Street in Philadelphia (a “sanctuary city“). Unicorn Riot has been providing live coverage into the night. 7/5/18 – 10:57 PM EDT UPDATE: The #OccupyICEPHL encampment outside the ICE office at 8th and Cherry has mostly disbanded at this point; a new occupation is being set up at Philadelphia City Hall to demand Philadelphia’s Mayor end the information sharing relationship with the Philadelphia Police and ICE via the PARS system. Watch streams from 8th and Cherry below. 7/5/18 – 12:15 PM EDT UPDATE: Philadelphia police have just swept through the #OccupyICEPHL camp outside the Philadelphia ICE office, making seven arrests for “failure to disperse”. Counter-Terrorism Unit, SWAT, DHS federal police, and Philly bike police have formed a crowd control line on the street facing #AbolishICE protesters. 7/3/18 – 2:15 PM EDT UPDATE: Philadelphia Police say 29 #AbolishICE protesters were “issued citations for Failure to Disperse” outside the ICE offices. Two protesters were injured, one person was transported to an area hospital for treatment. 7/3/18 – 12:30 PM EDT UPDATE: Philadelphia Counter-Terrorism Unit & DHS federal police have cleared #AbolishICE protesters from two garage entrances used to move ICE detainees. Activist legal support estimates ~20+ arrests & likely injuries – officers seen punching & pulling people from crowd, throwing them to the ground as police clear the street. 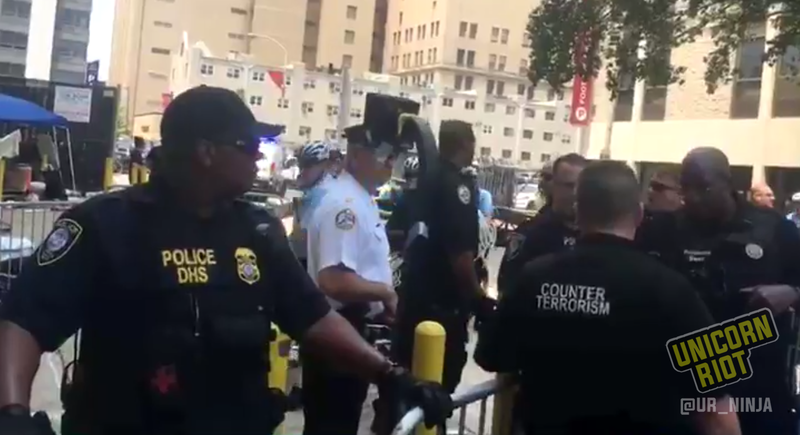 7/3/18 – 12:00 PM EDT UPDATE: Philadelphia Counter-Terrorism Unit and DHS are using pain compliance to break up protesters and make arrests that are blocking the ICE garage entrances. Counter-terrorism unit is making arrests. 7/2/18 – 11:00 PM EDT UPDATE: Philadelphia police have issued a “final warning”. Tents are blocking the ICE building garage entrances while protesters and vehicles are blocking the roads. Department of Homeland Security federal police and Counter Terrorism units are on scene with gas masks, along with Philadelphia police. Philadelphia police have requested a “mass arrest” team. Militarized police aka Mobile Field Force units (MFF)* are on the scene with zip ties and “less-lethal” weapons ready to make arrests. Police A/V units are gathering intelligence. Unicorn Riot will provide more live updates as the situation unfolds throughout the night. * National Mobile Field Force doctrine training is provided via the Federal Emergency Management Agency, a 135-page guide found by Unicorn Riot in a data request revealed in November 2016. The occupation was set up during a ‘STOP ICE’ rally held Monday afternoon at City Hall. The rally, endorsed by over 10 local Philly activist groups, presented three key demands: an end to deportations, the closure of the Berks County Family Detention Center outside of Philadelphia, and an end to Philly Police’s information-sharing relationship with ICE. ICE’s Philadelphia office made headlines earlier this year when a ProPublica investigation found that the Philly branch of ICE, which covers a 3-state area, makes more arrests of immigrants without no criminal history than any other branch. Other ‘#OccupyICE’ encampments have sprung up recently in several cities including Portland, New York City, Atlanta, Los Angeles, and Detroit.